The Best of Mother Lovett. I’ve got Mother Lovett on the brain. I made her orange cake for Easter, though according to her I did everything wrong, down to serving it as a layer cake and not in a 9 x 13 pan. I added cream cheese to the frosting. I forgot to put the coconut in the batter. I zested the oranges myself instead of berating my husband like a child until he caved under my abuse and scraped every last bit of rind from the sweet citrus. It’s hard to believe that today marks two whole years since we said our goodbyes to her. At times it feels like just yesterday I was standing in her kitchen, gulping over-sweetened iced tea to cure my unquenchable thirst and sneaking way too many Snickers bars from the cupboard below the bar. I reset her kitchen timer to make sure she didn’t burn the (millionth) batch of chocolate chip cookies and I threw away the aluminum foil that had blanketed her baking tins since 2002. Someone had to do it. I’ve already told you about how she was stubborn and proud and strong and courageous and stubborn. I’ve already told you how we served her half a birthday cake on her 88th birthday, and just happened to be lucky enough that she was too short to notice. Facts of her life are peppered across this blog. She married brothers. She walked around with four blockages in three arteries for over 20 years, surviving on buttered crackers and lard-laden pie crusts. She accidentally hoarded condiments, surely a symptom of the Great Depression, leading us to laughs that begin in the bottom of your belly and rise up… all over a bottle of soy sauce that expired in 1979. She once rolled down the grassy bank in front of her house while picking some weeds. She never got names correct; after an hour-long visit one afternoon she was shocked to discover that I wasn’t my cousin Lacy. And I’ve already told you as much as I can possibly tell you about a 4-foot-eleven, legally blind and legally deaf little spark plug, one who wore high heels until the day she died and drew on eyebrows with pink lip liner. I wish that she would have been living when I started this blog, selfishly of course, because she would have given me fabulous material like she did back in early 2008. So the only other thing you need to know is that you must make this cake. Juicy oranges, creamy yellow cake, sweet and shredded coconut… all enveloped with a creamy orange frosting and a heavy-handed dusting of coconut. It’s perfect. Preheat over to 350 degrees. Zest and juice the oranges. Sift flour, salt and baking power and set aside. Cream butter and sugar in the bowl of an electric mixer until light and fluffy, about 2-3 minutes. Add eggs one at a time, then add vanilla. After the mixture has come together, add in half the of the dry ingredients and mix. Add in the orange juice, then the rest of the dry ingredients. Add in the orange zest and fold in coconut and mix until dispersed. Add milk if needed. Pour batter in two 8-inch buttered and floured cake pans. Bake for 25-30 minutes, or until cake is not jiggly in the middle. Let cool completely before frosting. 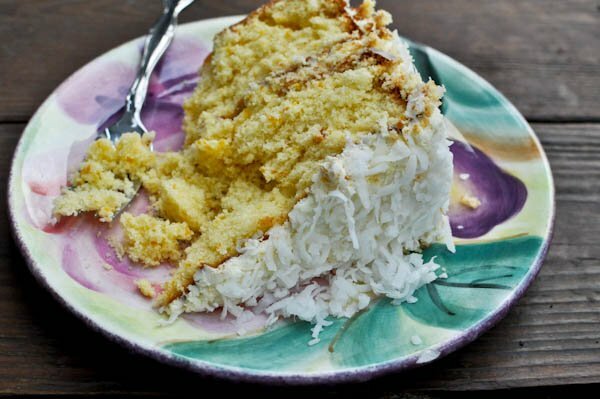 Note: Cakes with shredded coconut in the batter tend to be a bit crumbly. Also, this recipe came with NO instructions. I had to make some up as I went a long, but if you feel you need more liquid, add store bought orange juice or more milk until you get the consistency of cake batter. Cream butter and cream cheese until smooth. Add in sugar 1/2 cup at a time with the mixer on slow speed, gradually increasing as you go. Add the orange juice and zest. If more liquid is required, add orange juice. 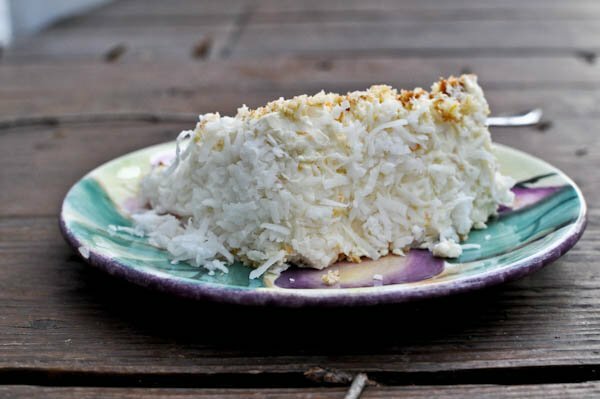 Frost cake as desired and then cover with coconut. I’m still full from yesterday. I made this cake the other night as a birthday surprise for a friend. It turned out delicious! I cut the recipe in half, but used two eggs, which seemed to combat excessive crumbliness. Were I to make the full batch (which is likely, though maybe as a coconut-lime variation), I would probably use four eggs. Anyway. 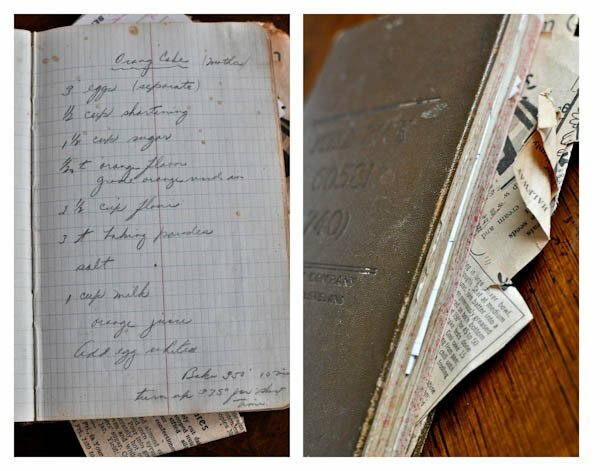 Great story to go with a great recipe! Delicious! I made your Mother Lovett’s cake with the frosting too for our Easter celebration and it turned out perfectly. Almost as good as getting to eat it was getting to smell the lovely orange scent wafting through the house when it was fresh baked yesterday. Such a fresh Spring taste combination – orange and coconut. Thank you for sharing. Exactly how have you be capable of develop this kind of wonderful crowd regarding commenters to your website? Tai chi is an ancient Chinese tradition that, today, is practiced as a graceful form of exercise. It involves a series of movements performed in a slow, focused manner and accompanied by deep breathing. *..^..